QI Life is your main resource for running your QI Project, all team members can contribute to project using this online workspace. You can plan your project with driver diagrams and develop change ideas, you can test ideas using PDSA (Plan Do Study Act) cycles and record all of your data within a system that automatically plots run and control charts for you. Throughout your QI project you should use the Model for Improvement. are looking to carry out a QI project, we will help guide you to develop your idea and test it out using this simple framework. The model consists of two parts. 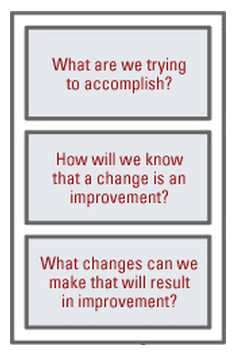 The first three questions help us define what we want to achieve, what ideas we think might make a difference, and what we’ll measure to help us understand if change is an improvement. You will have already worked through this by completing your charter. The second part is the PDSA (Plan Do Study Act) cycle – outlining the steps for the actual testing of the change ideas. The cyclical nature allows the change to be refined and improved through repeated cycles of testing and learning. This provides a vehicle for continuous improvement. Watch these two short videos with Bob Lloyd from the IHI who explains more…. Take the quality issue you’ve identified and turning it into an aim. Also think why your improvement project matters to patients and whether there is a business case for it. This question focuses on one thing. Measurement. Measuring key parameters linked to your project will allow you to track improvement over time and will help you identify quality problems but also opportunities. For every project we normally use between 5-8 outcome, process and balance measures. To make an improvement you’ll need to make changes, but how do you start to identify potential changes? One technique for attacking this problem is using driver diagrams. Please refer to starting your QI project for further information on all of the above. The second part of the Model for Improvement is effectively your engine for developing, testing and implementing changes. This is carried out by using Plan, Do, Study, Act (PDSA) cycles. Plan-What will happen if we try something different? What is our objective in this cycle? What questions do we want to ask and what are our predictions? PDSA cycles allow you to take change ideas you have created, try them in practice, learn what is or isn’t working with them and then adjust your approach. 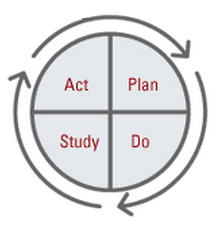 It is rare to achieve absolute success through your first PDSA cycle. Most commonly you will need to adjust your change idea through a number of PDSA cycles before it starts to work reliably in actual practice. The important point to note is that failure is not the end and can be a useful thing! By meeting on a regular basis as a team and going through PDSA cycles you will be doing something called rapid cycle testing. This will allow you to see meaningful change within months that would otherwise take years. In the early stages of your project you will already have identified a number of measures that you will want to use to show whether your project is starting to create improvement. But how do you use this data you are collecting to show whether you are or aren’t improving? 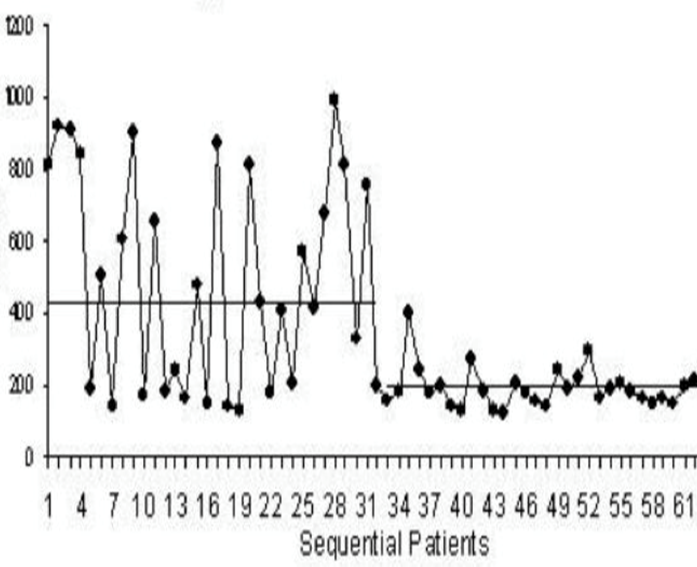 In improvement methodology we collect small amounts of data but regularly and use things called run charts or control charts to look at how this varies over time. Below is an example of a run chart. Run or control charts are particularly focused on looking at one thing. Variation. It is important to understand that everything varies over time. A run chart acts a bit like a camcorder, showing you every up and down. Snapshot audits (that you may well have done before) are a bit more like a camera, taking a picture of what things look like at just one point in time. To be able to show that things have improved we not only need to be able to show the things have changed, but also that this is not a one off. In other words, the change has been sustained. Run or control charts allow us to see if this has happened. QI Life give allows you to enter your project data quickly and easily, it then automatically generates the run and control charts for you identify trends, shifts and other points of significance. There are also many other tools you can use in your Quality Improvement work, as such we’ve built an Improvement Tools section of the microsite to help you navigate these. If you prefer to use Excel you are also able to access some specialist software called QI Charts which will enable you to easily create run and control charts in Excel. Please visit these sections for further details.